Why are so many journalists arrested in Turkey? 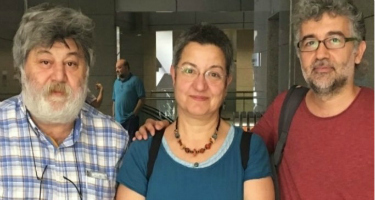 Journalists Erol Önderoglu , Ahmet Nesin and Physician Prof. Dr. Şebnem Korur Fincancı were arrested on June 20, 2016. Why? The Freedom of Expression Network-Turkey explains the basics. Journalists Erol Önderoglu , Ahmet Nesin and Physician Prof. Dr. Şebnem Korur Fincancı were arrested on June 20, 2016. Why? Daily “Özgür Gündem” is the main newspaper of Kurdish opposition in Turkey. Against it, there have been 149 investigations –and at the end- 110 cases opened, to silent the voice of Kurds (Since July 1995- State Security Council’s declaration). An imprisonment between 2 years 9 months and 13 years 9 months is demanded for each responsible editor. “Responsible Editor” is the person to be held responsible for each and every article published in the newspaper. Newspapers have been using the method of “declaring their voluntary supporters’ names as Responsible Editors,” so that they would face the investigations, trials, even sentences while the professional staff could continue publishing. Özgür Gündem has launched the “Co-Editorship-in-Chief Campaign” and invited prominent individuals to show solidarity to defend press freedom against oppressions, investigations and cases, by taking the risk, just like a “Lightning Rod”. Since May 3, 2016 –the World Press Freedom Day- 55 volunteers participated –each for one day- and investigations were opened for 41 of them, but no one was arrested before Önderoğlu, Nesin and Fincancı. Judicial tricks of JDP (AKP): Justice and Development Party (One man party of Erdoğan) has changed many articles of laws to control the judiciary, completely. Depending on those changes, they reassigned the judges and prosecutors. New (partisan) prosecutors forwarded defendants to new (partisan) judges to have them arrested easily. In the last example, the partisan prosecutor invited those 3 people -whom he wanted to get arrested- for interrogation, exactly on the day his most trusted judge was on duty First he interrogated(!) them, then sent them to the court on duty(!) and had them arrested. Erol Önderoğlu: I am a journalist; my duty is to defend the right to freedom of information. For that matter I help to distribute every kind of information – no matter which tendency it has- to the society. Lawyer Özcan Kılıç: According to Anti – terror Law, Code of Criminal Procedure Article 100 this is not included in defined crimes. Accusation is misplead in terms of procedure. Lawyer Meriç Eyüboğlu: After the decision against Turkey by ECHR, with the amended article 7/2 of Anti-terror Law, the scope of the offence is limited to the cases of making the propaganda for the methods of a terrorist organization constituting coercion, violence or threats through legitimizing or praising or encouraging the use of these methods. There is no such situation in this case. Erol Önderoğlu is declared as the Responsible Chief Editor (at the editorial tag of the newspaper’s issue dated 05/18/2016) so he takes the legal responsibility for all anonymous articles and news. There is a strong suspicion that Erol Önderoğlu committed the crime of terrorist propaganda. For the reason the crime is committed through the press it exceed the upper limit required for arrest. There is not any condition mentioned in Code of Criminal Procedure that prevents detention. “Judicial control measure” described as a light control measure would be a half measure in this case, therefore the decision is ARREST. Norwegian PEN ask members of the Norwegian delegation currently on a state visit to Turkey, to react sharply and raise this issue with its host. A court in Istanbul yesterday issued a ruling in the so called MLCP case where journalists Fusun Erdoğan, Bayram Namaz, Sedat Senoglu, Ibrahim Cicek, Ziya Ulusoy and Arif Çelebi was sentenced to life imprisonment . According to local media journalists were accused of being members of a Marxist organization ( MLCP ) prohibited acc. the Turkish anti – terrorist legislation. Erdoğan was accused of being the leader of MLCP because she is the founder of the radio station Özgür Radyo who are critical of the government. «Journalists are not terrorists» ! This is the clear message European Federation of Journalists ( EFJ ) submitted to the Turkish Prime Minister Recep Tayyip Erdoğan on «Stand Up for Journalism Day», after the judgment was announced yesterday. International Federation of Journalists ( IFJ ) has joined the EFJ and now requires that the life sentences given to Fusun Erdoğan and five other journalists be appealed. Norwegian PEN believes these recent rulings are particularly grave examples of the Turkish government’s attempt to gag journalists, and yet another illustration of the regime’s brutal use of anti-terror laws to stop free speech . Norwegian PEN ask the Norwegian delegation , who are still in Turkey , to react sharply and raise this issue with its host. Additional background information follows this press release . In a letter she passed from Gebze women’s prison outside Istanbul, Fusün Erdoğan, founder and director of the leftist broadcaster Özgür Radyo, details circumstances of her arrest, imprisonment, and politicized criminal charges. Erdoğan founded the broadcaster in 1995, and worked as its director until September 8, 2006–the day when plainclothes police agents detained her in the city of Izmir, she writes in the letter. She has been locked up ever since. «From the moment I was pushed into that vehicle, I lost sense of time and place because I was sandwiched between the front and rear seats, and my eyes were covered. I did not know where they were taking me,» Erdoğan wrote. After they brought her to an unknown building, the agents told Erdoğan «to lie down the same way next to other people who were on the floor face down.» When she refused, they forced her to do so. Next, she was videotaped, humiliated, and thrown into jail. Authorities in Turkey–the world’s worst jailer of journalists, according to CPJ’s prison census–would not tell Erdoğan or her lawyers the reasons for her arrest for two years. In 2008, prosecutors finally disclosed her indictment–she was accused of leading an illegal organization and attempting to overthrow the constitutional order by force–and asked the court to jail her for life without parole. Erdoğan and her lawyers dispute the allegations and the procedure leading to her imprisonment and say there is no concrete evidence against her. The journalist describes how her health has deteriorated and asks for solidarity. Turkish authorities have mounted one of the world’s most widespread crackdowns on press freedom in recent history. At least 76 journalists were imprisoned, nearly all on anti-state charges, when Committee to Protect Journalists (CPJ) conducted an extensive survey in August 2012. More than three-quarters had not been convicted of a crime but had been held for many months or even years as they awaited trial or a court verdict. Scores of other journalists have faced criminal charges, many of them multiple counts, for critical coverage seen as “denigrating Turkishness” or influencing the outcome of a trial. Between 3,000 and 5,000 criminal cases were pending against journalists nationwide at the end of 2011, according to the estimates of Turkish press groups. Erdoğan has led this anti-press campaign, personally filing several defamation lawsuits against journalists, while he and his government have pressured news organizations to rein in critical staffers. These actions have sown widespread self-censorship as news outlets and their journalists, fearful of financial, professional, or legal reprisals, shy from sensitive topics such as the Kurdish issue and the crackdown on free expression itself. Of the 76 journalists imprisoned on August 1, 2012, at least 61 were being jailed in direct reprisal for their journalism, according to CPJ’s analysis, which was based on a review of court documents and Justice Ministry records, along with interviews with defendants and lawyers involved in the cases. The evidence against the other 15 journalists was less clear, and CPJ continues to investigate the basis for their detentions. The imprisonments constitute one of the largest crackdowns CPJ has documented in the 27 years it has been compiling records on journalists in prison. Each year, to mark the Day of the Imprisoned Writer on 15 November, the WiPC names five cases of individual writers under threat in different parts of the world. This helps PEN members to focus their campaign activities and publicise these cases on or around 15 November. PEN Centres also organise events featuring their own high-profile cases, usually writers who have been made “honorary members” of their centre. On 15 November, some centres present annual freedom of expression awards, such as Swedish PEN’s Tucholsky Award, and the Oxfam Novib PEN Award in the Hague. This year, we have chosen cases from Iran, Mexico, Cameroon, Syria and Uzbekistan. These case will soon be posted on the PEN Website. The Writers in Prison Committee (WiPC) of PEN International is seriously concerned about the health of Robert Mintya, editor of the newspaper Le Devoir, who has been imprisoned pending trial for alleged forgery since February 2010. Mintya was briefly hospitalised in late August after being attacked by another prisoner and on 28 September was transferred to a psychiatric hospital. If convicted, he and his co-defendant will face up to 20 years in prison. Robert Mintya was arrested and briefly detained in early February 2010, along with editors Germain “Bibi” Ngota Ngota (Cameroun Express) and Serge Sabouang (La Nation), and journalist Simon Hervé Nko’o (Bebela). The journalists had been investigating alleged corruption involving Laurent Esso, Secretary General of the President’s Office, and the state-run oil company, National Hydrocarbons Company (SNH), of which Esso is also board chairman. Nko’o, who was reportedly tortured while in custody, went into hiding following his release. Mintya, Sabouang and Ngota were re-arrested on 26 February and charged with forging Esso’s signature in a document and using it in an attempt to discredit him. All three were transferred to Kondengui prison in the capital Yaoundé on 10 March. Ngota’s health deteriorated in custody and on 22 April he died due to a lack of medical attention, according to his death certificate. The Cameroonian government has denied this and allegations that Ngota had been tortured, stating that he had tested positive for HIV while in prison and had died of infections arising from this condition. His wife refutes this. On 8 August, Mintya was reportedly beaten around the head by another prison inmate, causing him to lose consciousness. He was admitted to the prison infirmary and on 25 August was transferred to Yaoundé central hospital. However, he was reportedly given only limited access to medical care and was returned to his prison cell a few days later. It is thought that the attack on Mintya may have been a reprisal for his implication of other people in the forgery case. Mintya was reportedly told that he would be freed if he signed a statement saying that he had been led astray and wrote a number of letters to Esso apologising for the forgery, some of which were published in L’Anecdote, a newspaper that supports Esso. When he failed to secure his release, Mintya reportedly wrote more letters accusing other leading Cameroonian personalities of being behind the forgery. On 28 September Mintya was reportedly transferred to a psychiatric hospital. His deteriorating state of health and lack of adequate medical treatment are extremely alarming, especially considering Ngota’s death in custody. Mintya and Sabouang reportedly face up to 20 years in prison if convicted. Another Cameroonian journalist recently denied medical care in prison is La Détente Libre publisher Lewis Medjo, who was released from prison in May after serving 20 months in prison for allegedly “publishing false news” about President Biya. Medjo suffered serious health problems while in jail which went largely untreated, causing him to lose hearing in one ear. He has reportedly suffered ongoing threats and harassment since his release. Singer-songwriter Lapiro de Mbanga (aka Pierre Roger Lambo Sandjo) – one of the cases highlighted for last year’s Day of the Imprisoned Writer – remains behind bars. Mbanga’s final appeal and request for parole have still not been considered by the Supreme Court despite having served two and a half years of a three-year prison sentence for allegedly taking part in anti-government riots in 2008. The WiPC protests the pre-trial detention since February 2010 of editors Robert Mintya and Serge Sabouang. It calls for their immediate and unconditional release, as well as that of singer-songwriter Lapiro de Mbanga, all detained in violation of their right to freedom of expression. Noting the 22 April death in custody of Germain “Bibi” Ngota Ngota, attributed to lack of medical attention, the WiPC also calls on the Cameroonian authorities to ensure that Mintya receives adequate healthcare while he remains in detention. Please send copies of any replies you may receive from the authorities to Tamsin Mitchell at PEN International in London. The Writers in Prison Committee of PEN International condemns the nineteen-and-a-half year sentence handed down to Iranian-Canadian journalist and blogger Hossein Derakhshan by a Revolutionary Court on 29 September 2010. Derakhshan has been held since 1 November 2008 for comments posted on his weblog. PEN International considers Hossein Derakhshan to be detained solely for the peaceful exercise of his right to free expression, and therefore in violation of Article 19 of the United Nations International Covenant on Civil and Political Rights, to which Iran is a signatory. It calls for his immediate and unconditional release, and seeks assurances of his well-being in detention. According to PEN’s information, Hossein Derakhshan was arrested from his family home in Tehran on 1 November 2008 shortly after returning to Iran from several years living in Canada and the United Kingdom. The authorities did not officially acknowledge his detention until 30 December 2008. He spent the first nine months of his detention in solitary confinement in Tehran’s Evin prison, where he is said to have been tortured. Initial reports suggested that he was accused of “spying for Israel”, apparently because of a highly publicised trip he made to Israel (with whom Iran has no diplomatic relations) in 2006, travelling on a Canadian passport. He also faced accusations of ‘insulting religion’ in his blogs. Derakhshan was tried in June 2010, but no verdict was made known until late September 2010 when it was reported by the Farsi news website Mashreq that he had been convicted on charges of “propagating against the regime”, “co-operating with hostile states”, “promoting counter-revolutionary groups”, “insulting Islamic thought and religious figures” and “managing obscene websites”. Nicknamed “the Blogfather”, Hossein Derakhshan, 33, is known for pioneering blogging in Iran with his Internet diaries, in both English and Farsi, which have been critical of the Iranian authorities, although more recently sympathetic to President Mahmoud Ahmadinejad. Hossein Derakhshan is held at Tehran’s Evin prison, where conditions are poor and reports of ill-treatment are widespread. • Seeking assurances of his well-being in detention. Please check with PEN International if sending appeals after 31 October 2010 and please send copies of any replies to Cathy McCann at cathy.mccann@internationalpen.org.uk. The Writers in Prison Committee of PEN International (WiPC) condemns the lack of progress investigating the murder of José Bladimir Antuna García, which remains unsolved a year after his death. Antuna, a crime and security affairs reporter for the newspaper El Tiempo de Durango, was abducted while on his way to work in Durango, capital of Durango State, on 2 November 2009. He was found dead later that day; his body showed signs of torture. A year later, the murder remains unsolved and nine other print journalists have been killed in Mexico, bringing the death toll since 2004 to 35. José Bladimir Antuna García, 39, was found to have died of «asphyxia from strangulation» but, according to some reports, his body also bore bullet wounds to the head and abdomen. A note found next to his body stated: “This happened to me for giving information to soldiers and for writing too much.” In the week before his death, Antuna had reportedly broken a story about police corruption in Durango and had also been investigating the unsolved murder of another El Tiempo de Durango journalist, Carlos Ortega Samper, who had been similarly abducted and killed in May 2009. Antuna had reportedly been receiving death threats since late 2008 and was the target of an apparent assassination attempt on 28 April 2009. Despite reporting the latter to the Durango state attorney general’s office, Antuna was not provided with any protection and continued to receive threats. On 26 May 2009, another Durango-based journalist, Eliseo Barrón Hernández, was found dead after having been kidnapped from his home. On the same day, an anonymous caller phoned the El Tiempo de Durango offices saying that Antuna would be next. Antuna had reportedly exchanged information about police corruption and organised crime with Barrón on several occasions. Antuna had previously received numerous threats on his mobile and work telephone, warning him not to publish «delicate» information. The caller sometimes identified himself as a member of Los Zetas, a paramilitary group reportedly linked to the Gulf drug cartel. One of the calls was apparently made from inside the Gómez Palacio penitentiary in Durango. On 1 October 2009, Antuna said that he had received a summons at the El Tiempo office, ordering him to provide a statement to the state attorney general’s office on 6 October. No reason was given for the summons. El Tiempo published an article about it in an effort to protect Antuna. This failed to prevent his murder a month later. Because no one knows who killed Antuna, reporting on crime and corruption in Durango has virtually ceased: journalists are afraid they might expose links between the authorities, police and drug cartels and meet the same fate as Antuna, Barrón and Ortega. Antuna’s wife and son continue to suffer intimidation, presumably at the hands of those who threatened and murdered the journalist. Violence against journalists in Mexico continues to escalate, with eight print journalists murdered and three others disappeared in 2010 to date. In 2009, seven were killed and one went missing. Since January 2004, a total of 35 print journalists have been murdered and nine disappeared. The numbers are higher still if broadcast journalists are taken into account. Countless other reporters have also been threatened, attacked and otherwise harassed. Few of these crimes are properly investigated or punished, laregly due to incompetence and corruption among Mexican law enforcement officials, particularly at the state and local level. According to CPJ, impunity has reigned in over 90 percent of press-related crimes in the last decade. However the majority of the crimes are likely to be related to the drug cartels who are struggling to control the media as they do territory, via “plomo o plata” (“lead or silver”). They appear to be winning, despite – or some say because of – President Calderón’s military crackdown on drug trafficking and organised crime. Since it began in 2006, an estimated 28,000 citizens have been killed. It appears that in many areas the authorities are simply not in control and have been infiltrated by the cartels. The Writers in Prison Committee of PEN International (WiPC) condemns the lack of progress made in the investigation into the murder of José Bladimir Antuna García, which remains unsolved a year after his death. It requests assurances from the government of President Felipe Calderón that a full and impartial investigation is being carried out into Antuna’s murder, and details of any progress in the investigation to date. The WiPC also calls on the authorities to renew their efforts to shed light on all other unsolved crimes against journalists, particularly the 34 other murders and nine disappearances of print journalists since 2004. It urges the President to fulfill his promise to make crimes against journalists a federal offence and to set up journalist protection programmes. Please also send copies of your appeals to Dr Gustavo Salas Chávez, Special Prosecutor for Crimes against Journalists and Freedom of Expression (email: feadp@pgr.gob.mx), and to the Mexican Embassy in your country (see Secretaría de Relaciones Exteriores (Ministry of Foreign Affairs)). Please send copies of any replies you may receive from the authorities to Tamsin Mitchell at the PEN International in London. The Writers in Prison Committee of PEN International is seriously concerned about the detention of Tal Al-Mallouhi a 19 year-old blogger, poet and high school student, who is said to be facing charges of espionage. She has been held incommunicado in Damascus since 27 December 2009, although her detention was not publicised until late August 2010. She is considered to be at risk of torture and ill-treatment, and there are concerns for her well-being in detention. No reason has been made known for the charges against her, although it is feared that Al-Mallouhi could be targeted for her online writings and poems which reportedly discuss political and social issues. According to information received by PEN International, Al-Mallouhi was detained on 27 December 2009 after being summoned for questioning about her blog entries. After her arrest, state security officers raided her family home and confiscated her computer, notebook and other personal documents. She was held incommunicado at an undisclosed location without charge or access to her family for the first nine months of her detention. Her family was allowed to visit her for the first time at Doma prison in Damascus on 30 September 2010. Until recently Al-Mallouhi’s family have sought her release through diplomatic negotiations and therefore did not want any publicity on the case. However, on 2 September 2010, her mother published an open letter to the Syrian president seeking information about her daughter’s welfare and calling for her release. On 5 October 2010 it was reported that Al-Mallouhi had been charged with spying for a foreign country. Al-Mallouhi has no known political affiliations, and sources close to the family are baffled by the charges. It is feared that she could be targeted for comments and poems published in her blog (http://talmallohi.blogspot.com). Freedom of expression is highly restricted in Syria and PEN has long been concerned about the numbers of writers, journalists, poets and bloggers detained for their writings and non-violent opposition activities. Many have been sentenced by the Exceptional Supreme Court whose practices fall short of international standards of fairness. There are widespread reports of torture and other ill-treatment in Syria’s detention and interrogation centres, police stations and prisons. Detainees are often held for long periods incommunicado without charge or trial, during which time they are particularly at risk. PEN is also increasingly concerned about writer Raghdah Sa’id Hassan who was arrested by Tartus political security services on 10 February 2010 after writing her first novel. Raghda is still being held incommunicado without charge and has no access to either her family or a lawyer. Her current whereabouts remain unknown and there is mounting concern for her welfare. For information about previous PEN International alerts, go tohttp://www.internationalpen.org.uk/go/news/syria-novelist-arrested-fears-of-ill-treatment ). Please copy appeals to the diplomatic representative for Syria in your country if possible. PEN International calls for the immediate and unconditional release of Dilmurod Saidov, an independent Uzbek journalist, who was imprisoned for 12 years on 30 July 2009. Saidov was convicted of extortion and bribery, charges that international human rights observers regard as fabricated and motivated by a desire to punish Saidov for reporting on corruption in Samarkand. The Writers in Prison Committee (WiPC) of PEN International believes he is another victim of a worrying trend in Uzbekistan, where dubious criminal charges are used to silence writers critical of the government. Saidov, who has tuberculosis, has reportedly been denied adequate medical treatment in prison. Dilmurod Saidov was arrested at his home in Tashkent on 22 February 2009. He was detained on charges of extortion, following allegations made by the head of a large agricultural machinery and tractor park in Samarkand. Saidov had been investigating claims made by local farmers that authorities in the region had been allegedly illegally confiscating their property. In April 2009, he was also charged with forgery. In breech of Uzbek law, neither Saidov’s lawyer nor his family were informed in advance of the trial date on 1 June. He was convicted of both extortion and forgery in a closed session at the Tailak District Court and sentenced to 12 years in prison. When Vasila Inoyatova, director of the Uzbek human rights group Ezgulik, of which Saidov is a member, asked the court secretary why sentencing had been closed, she was told that it was «in the interest of security”. No further explanation was given. Human Rights Watch has described the trial as a “travesty of justice” owing to a series of procedural violations and false testimony. According to Saidov’s defence lawyer, key documents handed over to the investigator during the pre-trial investigation disappeared during the trial. Several key witnesses also withdrew their testimony, saying that they had been pressured into making false allegations against Saidov. Saidov, 48, has been under pressure from government officials since 2005, when, in an article in the newspaper Advokat-Press, he criticised human rights violations in Uzbekistan. His articles have been published in local newspapers and also by Voice of Freedom, the internet-based news agency that covers human rights violations in Central Asia. In late 2009, a tragic event added to Dilmurod Saidov’s suffering – his wife, Barno Jumanova, and their six-year-old daughter were killed in a car accident on their way to visit him in prison in Navoi. The journalist also requires regular medical treatment for acute tuberculosis but judges have dismissed formal petitions to have him released on medical grounds. I have become “guilty”, though I am blameless. I am not afraid of death – I live awaiting it. I lived, worked and walked along the path of justice, caring for those around me. In spite of everything, I always have been, and always will be convinced that my work is right……..Along the path to the truth, innocent people have suffered. If I, and other journalists like me, are imprisoned, then instead of Justice making decisions it will be Lawlessness… I have lost my health, my family and my freedom. I think that for any person, nothing could hurt more than that. So, I will hope and wait for justice to triumph. Freedom of expression in Uzbekistan remains severely restricted and writers and journalists are regularly convicted on the basis of spurious allegations and fabricated evidence, with little regard given to fair and proper legal procedure. Human rights defenders experience frequent harassment and threats of prosecution and the authorities block the activities of local and international non-governmental organisations. Prison detainees also live in very poor conditions and are often subject to ill-treatment. PEN International calls for Dilmurod Saidov’s immediate and unconditional release in accordance with Article 19 of the International Covenant on Civil and Political Rights, to which Uzbekistan is a signatory. Please send copies of any replies you may receive from the authorities to Sara Whyatt at PEN International in London. and on Facebook at http://apps.facebook.com/causes/petitions/398 We are collecting signatures until 20 March 2010 to coincide with the Iranian New Year. website and help us generate signatures to the petition (on the website or Facebook) by sending this invitation on to your lists and contacts. Let us know what action you’ve taken and if you’d like to be added to the list of participating organisations by writing to CPJ’s Andrew Levinson at alevinson@cpj.org. Please provide a contact name and email address and you will also be added to the campaign list-serv.